Now let's see some basic configuration settings for FeedBurner as well as how to get your own Feed icon(s), which is called "chicklet" here. 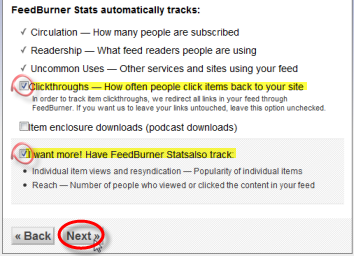 Have FeedBurner Stats also track: Individual item views and resyndication as well as Reach. Then click on "Next" to continue to the next screen. On the next screen you can see various tabs with many options. Go and click on the "Publicize" tab. On the left hand side you see many options; click on "Chicklet Chooser". Next you are presented with a list of several icons, which are called chicklets; if you choose one of the first 2 chicklets, your site visitors may choose one RSS feed-reader (or Aggregator) of their choice, in order to subscribe to your feed. There also other chicklets that let your visitors subscribe directly to a specific RSS feed-reader. After you select your preferred chicklet, scroll down to the bottom of the page and copy the HTML code, that FeedBurner created for you there. 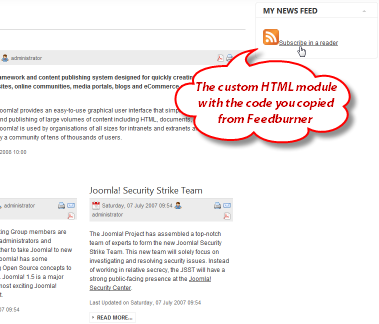 Now the only thing you have to do is go back to your Joomla administration back-end and create a custom HTML module pasting the chicklet HTML code from FeedBurner into it. Now the only thing you have to do is go back to your Joomla administration back-end and create a custom HTML module pasting the chicklet HTML code from FeedBurner into it. Then publish this module to a template position of your choice and take a look at the result. Now your site visitors will be able to subscribe to your RSS Feed easily through FeedBurner! I don't care if the page has no menu item displayed or one linking to '#' or one without a link, but not with a link to the rss feeder itself, that's not wanted of course. Does one of you have experience with this and what do you recomment to do, that'd be awesome. Wishing you all the best for the year. Thank you so much for this tutorial! I am so glad to find instructions on how to find the URL for my RSS feed without having to install additional extensions! There will be a person to spirit, stand up to it, your work is very beautiful, worthy of praise, let us together for the good life hard! Tons of Thanks for this tutorial..
Hi, thanks for this tips, but when I have submited my RSS Feed on FoodBurner, its link is refused. Now how does i do??? Thanks so much for this guide - I know how long those things take to produce! Much appreciated:) Works a treat (Joomla 1.5) So hard finding out about this stuff sometimes, so refreshing to find it explained so clearly. You're a star! I tried this and the traditional way..
Really great tip here. Thank you very much.